According to the latest rumors, AMD is working on a new chipset for their Ryzen Threadripper 2000 processors. Things are starting to look like the motherboard vendors are going to show X499 board boards at CES 2019. Apart from that the Z490 is supposed to be unveiled by then as well. During the past months we’ve heard rumors on these two upcoming chipsets on almost a regular basis. According to latest information, AMD is working on their X499 chipset, which is supposed to come with an I/O hub and other improvements for more flexibility. At the moment there isn’t any detailed information on what exactly is going to be different. If we were to make an educated guess we'd say that we can expect PCI Express Gen4 slots since AMD Vega uses that interface. If the launch date is true, AMD could release this chipset right after an expected release of the Intel X599 platform which might launch by the end of this year. Since AMD has already updated it’s X399 chipset to make it compatible with it’s Threadripper 2000 CPUs, it doesn’t make too much sense come up with a new chipset at this point in time. AMD seems to also have plans for a Z490 chipset, which is based on the AM4 platform, that rumor however has been ongoing for quite a few months now already. 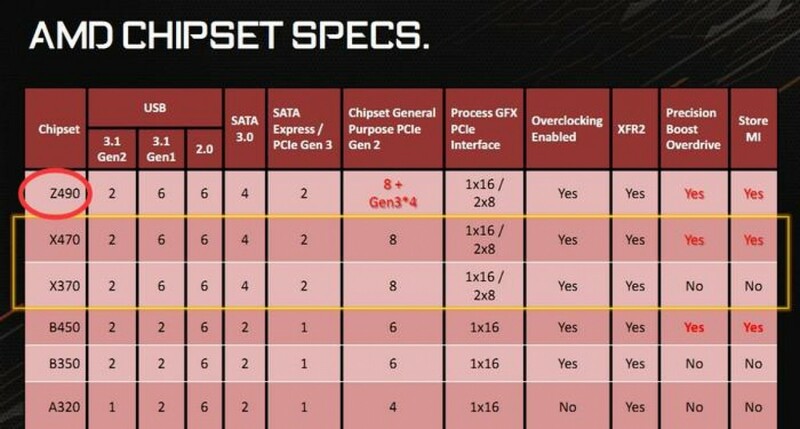 The upcoming AMD Z490 chipset might most likely feature 12 PCI-Express lanes instead of 8, which is what you get with the current X470. What's interesting, AMD chipsets currently use PCIe 2.0 and the new one would come with an additional four PCIe Gen 3.0 lanes. In the end this would allow for more flexibility on the storage side. After all these are rumors and therefore we’d recommend to take them all with a grain of salt.